Fans of two-time Formula 1 world champion Fernando Alonso are familiar with the driver’s ability on international Grand Prix circuits. The charismatic Alonso is also popular off-track, which made his appointment as ambassador for Spanish brand Viceroy in 2008 a natural alliance – an affable young champion for a rising, progressive brand. Alonso’s position atop the racing stratosphere remains the inspiration for Viceroy’s Fernando Alonso watch collection, the latest of which capture the essence of sport-casual by using streamlined combinations of materials and designs to reflect the impassioned, cutting-edge nature of racing sport. The chronograph model with reference number 47823-57 features a large polished 46 mm stainless steel case and a lightweight aluminum bezel with a gray-black hue. Novel looking chronograph pushers flank the crown; the black piston-head embellishment on each pusher further amplifies the motor-centricity of the watch and brings the pistons to life, and the look extends to the crown, too. Steel crown guards jut out to ensure no accidental pressure is applied to the crown when operating the pushers. In a racing sport of any sort, the chronograph function is essential, allowing operators to track intervals and elapsed time. Readability is therefore important. Partially skeletonized luminous sword hands and white indexes provide excellent contrast overtop the dial’s deep-black surface. The three sub-dials appear in a classic 3-6-9 layout. 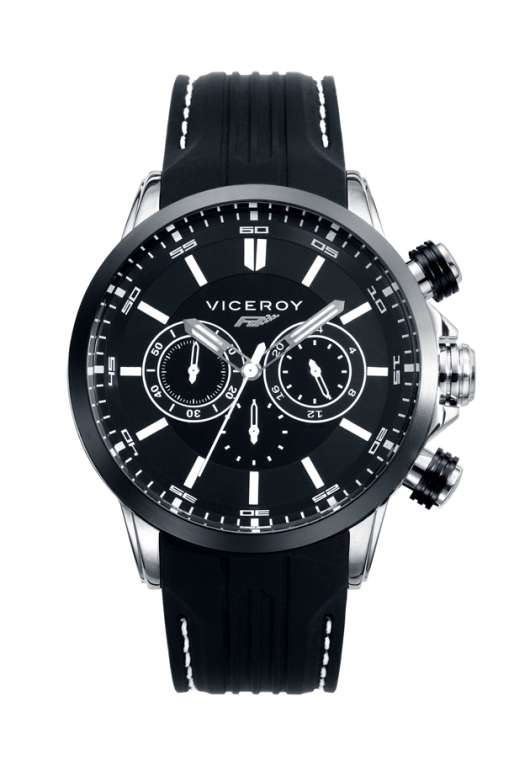 The only word on the dial is the Viceroy name, which appears above the FA checkered flag logo and the font chosen for the numbers around the chapter ring adds to the watch’s automotive disposition. A mineral crystal encases it all. Inside, a reliable quartz movement ticks away, safeguarded by a stainless steel caseback that contributes to the watch’s 164 feet of water resistance. In keeping with the sport-oriented personality of the watch, a black silicone strap featuring a prong buckle inscribed with a V is mounted to the lugs. The strap’s white stitching adds an element of refined detail and makes the watch even more versatile from a fashion point of view. Together, Fernando Alonso and Viceroy continue to find success by combining authenticity, expertise and a progressive winning spirit. Like the driver, the watch collection continues to build a strong reputation – it can be found all over the world – and with self-assured masculine models like the chronograph 47823-57, the success is sure to continue.